SAN FRANCISCO, CA (May 9th, 2016) Fullpower announced today that Philippe Kahn will be participating in a fireside chat on May 12th at 9:30am as part of The Future Connected Cars USA event. Led by Roger Lanctot, Associate Director at Strategy Analytics, the fireside chat will focus on “Examining the Connected Car – Implications of Consumer Attitudes to Data Privacy.” Manuela Papadopol, Director of Global Marketing at Elektrobit, will also participate. Philippe will discuss that while driving is part of what we do, like exercise and sleep it is essentially a sedentary “sitting is the new smoking” activity that needs to be balanced out. Any driving or commuting adds a sedentary element to our lifestyles, and the quantified self (IoT) helps us to look at the whole picture. Philippe will also cover extreme versions of this that can have unintended consequences. The Future Connected Cars USA event takes place May 10th-12th at the Santa Clara Exhibition Center and is co-located with Internet of Things World. Learn more at //usa.connectedcarsworld.com/. “Beautyrest SmartMotion™ is a game-changer in an over commoditized category. This is technology unlike anything seen in the Market as it is seamlessly integrated into a motion base so you don’t need to wear anything to track your sleep. With it, we’re able to drive category growth and add true value to retailers and consumers alike,” said Jeff Willard, Executive Vice President of Marketing for Simmons Bedding Company, LLC (“Simmons”). Inside all Mondaine Helvetica No1 Smart watches is the latest in smart technology focused on monitoring activity and sleep, featuring MotionX activity tracking, Sleeptracker sleep monitoring, sleep cycle alarms, get-active alerts, adaptive coaching and automatic time alignment – all the data from which can be backed up and stored in the MotionX cloud. The watch does not need to be recharged regularly, boasting a 2+ year battery life. It uses the horological smartwatch platform, power MotionX, which manages the bi-directional communication between the watch and whichever device, be it phone or tablet, it is connected to via the downloaded app. In complete contrast to other smart devices, where the data is shown digitally on the watch, the information is read in an analogue fashion via the sub dial. SAN FRANCISCO, CA (December 2nd, 2015)- Fullpower® Technologies today announced it has been awarded another important patent covering a sleep monitoring system, including monitoring a user’s movement to determine when the user is falling asleep, as well as distinguishing between power naps and longer sleeps. This enables the user to optimize their sleep patterns, including setting wake up alarms allowing them to wake at the optimal time in their sleep cycle to feel more refreshed. US Patent 9,192,326: Sleep Monitoring System. Movado Motion is a collection of fine Swiss made watches enhanced by smartwatch technology. Powered by MMT’s MotionX® technology platform, these iconic Movado watch designs deliver 24/7 MotionX activity monitoring. They are compatible with iOS 8 or later and Android 4.4.3 and later smart phones and tablets. 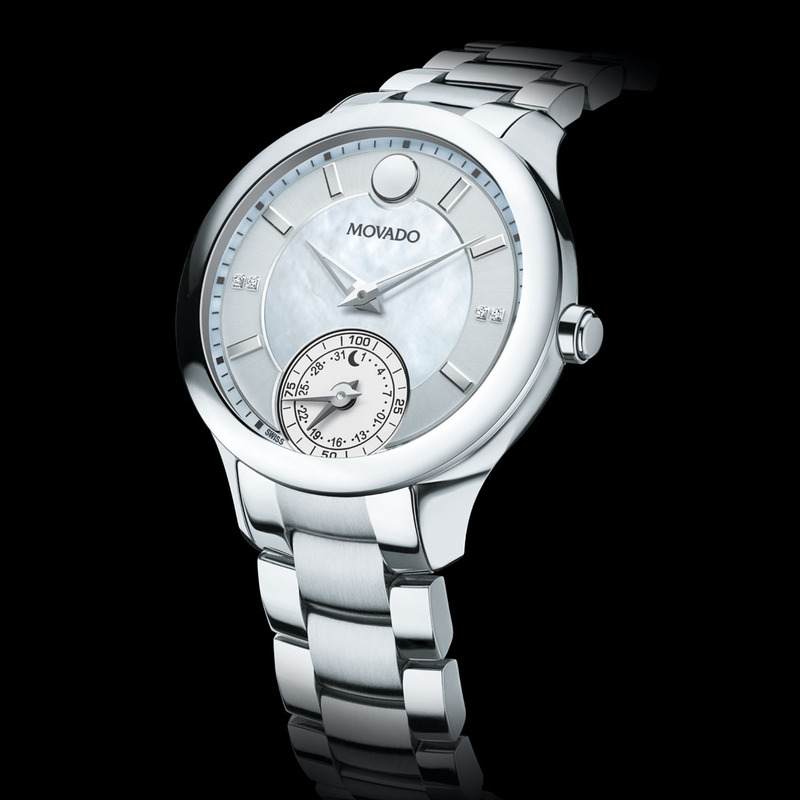 Offering styles for men and women, the Movado Motion collection is priced from $995 to $2,495. Simply intelligent, Movado Motion timepieces merge Swiss-made elegance and smartwatch technology. The modern analog dials feature a subdial with date indicator that also tracks steps and sleep activity towards fitness goals. Offering easy set-up and sync with a paired iOS or Android smart device, the collection includes the chic women’s Bellina and iconic men’s Museum Sport models. Powered by MMT’s MotionX-365 technology platform, the water-resistant Movado Motion collection and app support automatic local time/date setting through sync with the paired smart device, steps activity tracking, sleeptracker® sleep monitoring, sleep cycle alarms, get-active alerts, dynamic coaching, +2 years battery life, MotionX cloud back-up and restore. Designed to wrap a women’s wrist with style and comfort, the modern Bellina Motion sport watch design is meticulously crafted in solid stainless steel with a bezel smoothly polished, or fully set with 80 dazzling diamonds, or in versatile two-toned stainless steel. All three models sport luxurious mother-of-pearl/silver sunray dials detailed by diamond-set markers and applied silver-toned or gold-toned indices, matching hands and flat dot at 12 o’clock, and a date indicator/smart activity counter subdial at 6 o’clock. Presented on a classic sport link bracelet, the stylish Movado Bellina seamlessly blends fine Swiss watch design with cutting-edge connectivity. Movado’s iconic Museum Sport™ for men is available in three models, all featuring a black Museum dial® with iconic dot, minute reflector ring with white and bright orange printing, luminous hour/minute hands and date indicator/smartwatch activity counter subdial at 6 o’clock. Available with a stainless steel case topped by a black PVD-finished bezel on a perforated black rubber strap or a stainless steel deployment bracelet, or in a dramatic all-black-PVD bracelet model, the iconic Museum Sport is engineered for style and precision. SAN FRANCISCO, CA (November 16th, 2015)- Fullpower® Technologies today announced it has been awarded an important patent covering a power management methodology for mobile devices. This provides a method and system to schedule tasks in the most power efficient way based on what the user is currently doing. This patent is part of an intellectual property portfolio from Fullpower that includes more than 110 issued and pending patents. Broad coverage for the MotionX® Technology Platform and Sleeptracker® technology introduces a new and necessary approach for continuous activity and sleep monitoring and analysis, with applications spanning a variety of smartwatches, activity trackers, and the smart bed, as well as health and fitness, medical, business, lifestyle and navigation applications. Fullpower’s ongoing innovation translates into continually broadening and deepening of this sensor-fusion patent portfolio. US Patent 9,183,044: Optimizing Preemptive Operating System with Motion Sensing. Q: Why is this patent significant? A: Power management is critical for embedded devices, and optimizing the core embedded operating system for context is a breakthrough. Q: What are the potential use cases for the claims set forth in this patent? A: Fullpower’s core context sensitive power management methodologies are key, for example, to long battery life for wearables like smartwatches, fitness bands, and intelligent clothing. Q: Is this IP already part of any products you’ve powered? If not, when do you plan to start incorporating it? A: Yes, this IP is integrated in the Horological Smartwatch powered by MotionX and is one of the important reasons why we can achieve 2+ years of battery life with a simple coin-cell battery. Q: How does this patent fit in with the rest of the Fullpower IP portfolio? A: This patent is another keystone in Fullpower’s broad wearable and IoT patent portfolio.